I always find it interesting to find videos of Rules incidents that occur on one of the Pro Tours, as I believe that it is easier for golfers to understand and remember rulings when they see someone they recognise breaching a Rule and being penalised for it. 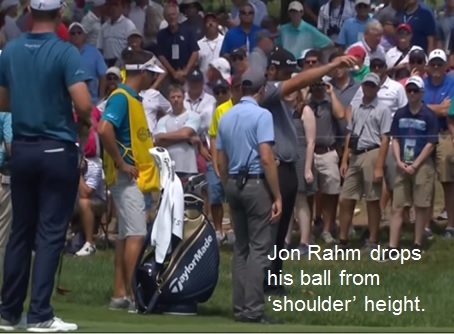 I was pleased to find a video of an incident concerning Spanish Pro, Jon Rahm (Rodriguez), during the 2018 PGA Championship at Bellerive. Sometimes a single incident can lead to several different nuances of the Rules of Golf and the subject of this blog provides an excellent example. There is a video of the whole incident at this YouTube link. The circumstance was that on the par-5 8th hole, Rahm’s 17th, he was looking for his ball in deep rough just a couple of paces off the fairway, when he felt his foot touch a ball, which he then identified as his. Whether he trod on it, or touched it with the toe or side of his shoe is not certain, as even he was not sure, if we can believe him. What is pretty certain is that when a player of Rahm’s size ‘touches’ their ball in long grass, the odds are that the ball will not have returned to the exact spot where it was at rest. If a player moves their own ball it is a breach of Rule 18-2 and they get a penalty of one stroke, even if it occurred while they were searching for their ball. Perhaps he thought that this was a factor that might help him get a favourable ruling. If only we all had marshals spotting our balls for us! As he was saying this he lifted his leg and pointed to the underside of the sole of his shoe, which indicates to me that it was most likely that he had trodden on it. The official ruled that given the circumstances it was most likely that the ball had moved and Rahm had to accept the penalty of one stroke. I will be generous and suggest that he probably knew the Rule, but was caught up in the pressure of the situation; many Rules officials claim that their duties are 95% boredom and 5% panic! Of course, any ball that is lifted under the Rules may be cleaned, except when it has been lifted to determine if it is unfit for play (Rule 5-3), for identification (Rule 12-2), or because it is assisting or interfering with play (Rule 22). Because Rahm was not sure whether he had moved his ball or not, and the ruling was that he had, he obviously could not then say where it had been at rest before he touched it, so that it could be replaced there. This meant that he had to drop a ball at the estimated spot (Rule 20-3c), which was pointed out to him by the official. If you haven’t yet viewed the video, I urge you to do so now. (Click here.) Did Rahm decide that he was going to do everything possible to make sure that his ball rolled forward when it was dropped, allowing him to place the ball after the second invalid drop? Rule 20-2 requires that the player must stand erect, hold the ball at shoulder height [not above!] and arm's length and drop it [i.e. straight down!]. A player is penalised if they take any action to influence the position or movement of a ball, Rule 1-2. This includes flicking the fingers, or spinning the ball, to ensure that it bounces forward when it hits the ground. I should emphasise that Rahm was not penalised for any of the above actions, but I know that if I had been the official I would have asked him to drop again. After two drops that resulted in his ball rolling forward, Rahm was allowed to place his ball where it had first hit the course on the re-drop and he played it from there. Despite the one stroke penalty for accidentally touching his ball in play he managed to par the par-5 hole. Jon Rahm may find some consolation in the fact that in the New Rules of Golf – 2019, Rule 7.4 states that there is no penalty if the player’s ball is accidentally moved by the player, opponent or anyone else while trying to find or identify it. '666 Questions on the NEW Rules of Golf - 2019' can now be purchased at this link.